Storefronts are crucial to the public eye. First impressions can make or break a business. Let our commercial pressure cleaning process bring back a fresh look to the exterior of your buildings. We also offer window low pressure washing, a process that bests hand washing. Our power cleaning pros use extra care to avoid damage to your window, while, at the same time, leaving a streakless shine. Pinellas Affordable Pressure Washing commercial services are available for all building exterior materials, such as stucco, brick, wood, etc. Don’t overlook your storefront roof….believe it or not, we have the ability to use a power washing process on any rooftop. Perhaps the entrance to your storefront is lined with decorative pavers….we can even apply a pressure cleaning to the pavers or stones and bring them back to life. An attractive walkway to any business (especially a storefront) is vital to drawing customers. The way to ensure that is to hire one of our mobile power commercial cleaning units. Office buildings can be big or can be small...nevertheless, no one wants to work in a less than clean office building nor does an office building owner or manager want to visit with guests or clients within a dirty business area. It goes without saying that the exterior of an office building should maintain just as clean an image outside as it does inside. Buildings of all nature of material can be thoroughly refreshed with the touch of our commercial pressure washing techniques. In addition to creating a fresh new look to an office building, regularly scheduled power cleaning of the building’s exterior keeps it from deteriorating while it is exposed to the harsh elements of Florida’s weather. Our expert pressure cleaning suggestion for commercial property would be to have your office building pressure washed at least once a year. Pinellas Affordable Pressure Washing can work up a schedule for you to get your office building on a pre-arranged power cleaning calendar, dated at your convenience. Restaurants are a big part of Florida’s business industry. When you plan to go out to eat at a nice restaurant, isn’t cleanliness a major issue? After all, we all want to eat in clean atmospheres. If the restaurant appears dirty on the exterior, the chances are it could be less than ideally clean on the interior. Don’t allow your pride and joy (restaurant) to take on a dull and unkempt appearance when the easy answer is right in front of you...Pinellas Affordable Pressure Washing! Our commercial cleaning with pressure mobile driver/operators will not only put your restaurant back into good stead but just the correct amount of pressure will be applied to clean the exterior walls, roof and even the restaurant windows. Our commercial pressure washing can be extended to the outer perimeters of your restaurant, such as walkways or ornamental stone, etc. Every precaution will be made to use low pressure so as not to displace any stones or pebbles. Stadiums WOW! We all know how much soil and grunge can accumulate in a public stadium! Concrete stadium floors suffer major issues that call for the powerful strength of industrial cleaning. We provide top of the line power cleaning to stadiums of all venues. Food and drink spillage, Mother Nature’s wind blown dirt and heavy foot traffic dragging in all sorts of muck from the streets are many of the situations calling for heavy duty commercial pressure cleaning. Then, of course, there is the occasional gum disposed of via the floor. Unfortunately and it sounds a bit gross, but public stadiums have also been known to bear the stench of human and animal urine. In all of these circumstances our well known company’s process of eliminating all manner of unwanted material is prime! A dirt ridden stadium calls for the expertise of commercial cleaning. In addition to the concrete, our mobile pressure cleansing equipment will tackle the seating in the stadium. How nice would it be for all stadium attendees to be able to sit down without experiencing the sticky, yucky feeling of the seats? In the field of commercial pressure washing, Pinellas Affordable Pressure Washing is second to none. We stand by our work in commercial, as well as residential power pressure cleaning. Schools, it’s very important that every school be sanitary and create an image of cleanliness. Our top of the line pressure cleaning services are capable of scrubbing Florida’s buildings of education. Our power cleaning process is well know in the commercial and business community. Exterior walls and roofs, as well as cement playgrounds must be kept as dirt free as is possible due to the fact that students have close contact with other students and teachers on a fairly daily basis. If the school building is permeated with germs, the possibility of the spreading of colds and viruses becomes prevalent. We can contract with any school to arrange for at least a yearly maintenance plan of high power pressure cleaning. Exterior, roof, windows and even some interior surfaces (for example: gym floors) are no challenge for our commercial power washing pros. Or, at least, try a one time overall power pressure process to bring your school up to proper cleaning standards and enhance the school’s appearance, while at the same time, ensuring better health issues for the whole community. Parking ​garages can be another source of concrete floors that are inundated with all ilks of stains, spills, gum and street residue. Car motors leak fluids, people’s shoes accumulate debris, food and drinks are often dropped and left to dry in and the occasional gum chewer gives no thought to spitting the sticky substance out onto the ground. All of this mars the appearance of parking lots and other public areas in commercial districts. Our professional cleaning techs use just the right equipment to perform a heavy duty wash of the parking garage’s concrete floor. No amount of sticky and unpleasant buildup can deter our commercial pressure cleaning crew from getting the job done. Parking garages would be well advised to have our company schedule a regular appointment for heavy duty cleaning (at least annually.) Even though a parking garage’s purpose is just to keep vehicles in wait for their owners, there is still that walk from car to destination. A nice clean cement pathway helps to keep customers from treading thru unwanted gunk. Keep Pinellas Affordable Pressure Washing in mind for commercial power washing the next time you need a superior power cleaning company. Apartments and Condos are you the owner or manager of an apartment building or condo units? Keeping your apartment and condominium building exteriors up to snuff is important to the success of your rental clients. Our impressive pressure cleaning methods are just the way to a potential renter. An apartment or condo dwelling is a big ticket item to take on for power washing but Pinellas Affordable Pressure Washing is up to the job! Our quality commercial pressure equipment can clean exterior walls, roofs and windows with just the correct amount of pressure. Our mobile power units will sweep the outside of your apartment or condo building with high powered pressure equipment and leave it looking fit for all observers to view. If you are in need of a heavy duty commercial pressure cleaning project to spruce up your property, apartment units or condominiums, look no further than Pinellas Affordable Pressure Washing. Call 727-440-4401 and get your power washing venture up and running asap. We specialize in power washing for all commercial projects. Gas stations are huge areas with foot traffic coming and going all the time and oil spills are a big detriment to the area, as well. Besides being unattractive, this is yet another area of safety concerns, with oil, gas, water spillage. This kind of dirt and contamination is best left to a professional commercial power cleaning company. We are a company that deals with stubborn stains and our power cleaning equipment is quite capable of using the force of pressure washing to dispel the trail of sludge marring the concrete. It might not seem like an area worth cleaning but a picture is worth a thousand words and it’s surprising how many people notice the difference between a newly cleaned concrete surface and one that has been neglected over a long period of time. Hire our commercial pressure washing experts for a one time pressure cleaning or, better still, arrange to have your gas station floor cleaned regularly. In addition to the ground, consider power cleaning the exterior walls for an even more appealing look. Due to the often frequent coming and going of gas station traffic, our commercial power cleaning company will arrange for night or after hours pressure cleaning whenever possible. Once our cleaning pros have finished the service section (where the gas pumps are) they will move onto the storefront entrance. Our pressure washing crews will give a heads up to the store manager and/or employees to prepare them for the cleaning project. Our experienced power pressure techs take every precaution for a safe cleaning. Gas pumps are covered. We also power wash the gas station canopies. Pinellas Affordable Pressure Washing keeps up to date on all local laws for commercial projects and meets the permit and expectation requirements of the National Pollution Discharge Elimination System (NPDES) Convenient stores are often attached to gas stations. Therefore, the same system is the rule of thumb as gas stations. Parking ​lots are home to all manner of litter. Gum is discarded carelessly, people flip their cigarettes off to the ground, fluid (such as oil) drippage, beverage and food stains permeate the floor. Not a pretty picture! A parking lot can be a reflection of your business. Let our commercial pressure cleaning company help you maintain the right image by doing a professional high powered washing. Our company works with the largest parking lots down to the smallest. Our pressure washing experienced pros use high tech washing equipment, as well as smaller units that are capable of getting into hard to reach corners and bends. Our power cleaning company is environmentally friendly and the top choice for many commercial enterprises seeking pressure cleaning and our prices are reasonable. Improve the appearance of your business parking lot. Our pressure cleaning services work with parking lots for medical buildings, hotels, restaurants and more. Schedule a commercially necessary power washing date for your parking garage or lot with our office. Do it one time or, better still, why not arrange for pressure cleaning on a regular basis. We will work with you at your convenience. Drive thru locations are all around us. Banks, pharmacies, fast food and even some grocery stores often offer the convenience of conducting business right from your car, allowing you the option not to have to go through the hassle of parking and getting out of your vehicle. Every business drive thru should be well maintained and present a pleasant picture to drive thru customers. How you maintain your drive thru area says a lot about your business. Since drive thrus experience a great deal of traffic, it is inevitable that stains, dirt and grime take their toll on the cement. This infiltration of gunk is very difficult to remove but if you put your cleanup woes in our pressure cleaning company’s capable hands, your worries will be over. We are a top of the line commercial property pressure washing business. Pinellas Affordable Pressure Washing equipment will not only clean the area where vehicles pass through but the power used will take care of the area surrounding the car lane. Our mobile pressure washing professionals use versatile methods that adapt to each cleanup scenario. No dirt is left behind! Schedule a one time high power pressure washing or sign up for regularly scheduled service. We work with all commercial cleaning ( banks, stores, pharmacies, dry cleaners and restaurants.) Speaking of restaurants, the amount of mess that accumulates in those drive thrus can be overwhelming (food, drinks, oil spills from old cars) and don’t even get me started about chewing gum! Once again, no stain or grime is too much for our state of the art equipment or our power cleaning experts. Commercial projects are our forte. Public sidewalks can get nasty with all of the pedestrian traffic and even pets walking on a daily basis. Inclement weather and litter all adds up to a mess. Just a quick hose down really doesn’t solve the problem. A professional industrial pressure washing is the answer. Our company is in the commercial pressure cleaning business and will work with cities and business owners to power away the buildup of sidewalk stains and dirt. Pinellas Affordable Pressure Washing is highly qualified to clean up the unwanted blight. Our pressure cleaning equipment is the best on the market and our cleaning techs are professionally experienced in using the company power washing tools. We can even get rid of pet stains and odor with our special method of pressure cleansing. By the way, don’t overlook your city curbs and streets. While it is nice to have freshly cleaned sidewalks, that image can be marred if the attached curbing is dirty and the road is stained. Commercially pressure cleaning streets and curbs is just another one of our many services. Keep the city shining. If you are a business owner or manager, don’t hesitate to call for our expert professional cleaning with power pressure mobile units. City leaders, do yourself and your town a favor and hire Pinellas Affordable Pressure Washing for all commercial industrial pressure cleaning. . We can keep your city better than clean…..we will make it squeaky clean. 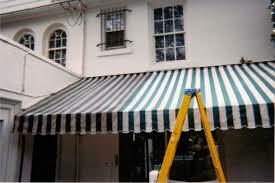 Awnings cover and protect all manner of business places. That being said, awnings and canopies tend to hold moisture, mildew and even mold if they are not maintained properly. An awning or canopy can be washed down occasionally with a bucket of water and a hose but that process will not stop the mildew. The only way to overcome the really tough stains and grit is to use high powered equipment with a “kick” to eliminate all of the gunk. Our commercial pressure cleaning professionals have the skill and the best equipment to accomplish what might seem to be an impossible task. Our techs are very well trained in the art of power washing and have the knowledge to apply the right amount of pressure to thoroughly wash any type of awning or canopy. Don’t try to do this difficult job yourself. Hire our professional canopy cleaning pros. Dumpster pads, how many of us not in a business are aware of an area called the dumpster pad? Not too many, I imagine. The fact is that behind most every business locale is a place (usually behind doors) where all the dregs of trash are tossed. Garbage bags get thrown in containers which smell and are just too nasty to think about. Trash bags leak and spill out all sorts of putrid items. Rotten food and old drinks, along with cigarette butts fall onto the dumpster pad, creating a mess and obnoxious odor to be washed away. All the spillage settles into the pavement and that can be a major pain to clean up. Our pressure cleaning process not only gets deep down into the dumpster pad concrete to extract all the imbedded stains and residue but once our power cleaning pros are finished, the unbearable stench will be gone. Our power pressure washing specializes in commercial properties. Fountains can be lovely decorative additions to a business community or commercial property. A fountain gives the feeling of peace. However, algae and various types of debris build up in and around a fountain over time and makes it difficult to clean in the conventional way. A really top notch cleaning by a professional commercial pressure washing company is the only way to get a fountain looking good again. Pinellas Affordable Pressure Washing guarantees to make any fountain beautiful and flowing properly again. We will blow away dirt, algae and all debris from your commercial property fountain without using harsh chemicals because our commercial power cleaning process is environmentally friendly. Keep your commercial entryway fountain in a-one shape, top functioning order and pleasant to view. With our commercial pressure equipment and expert fountain washers on the job, your commercial premises will make a great impression. Churches are on our commercial property list. If you are in the market for a professional power washing contractor to give your church a thorough pressure cleaning, look no further….we are a commercial pressure cleaning company that can help your members enjoy church services in comfort. Don’t allow the exterior of your church to become dull and dingy. Our company pressure washing pros will safely and expertly power wash the exterior of the building, as well as the church’s surrounding areas, such as walkways and even the parking lot. Most churches are adorned with ornate features and intricate surfaces and for this reason, we treat all of our commercial properties with the utmost care. Pinellas Affordable Pressure Washing offers interior pressure cleaning for churches. Our cleaning process will clean and sanitize a church’s pews and we can also power wash the floors. Just the right amount of power is used to keep from damaging surfaces. Our methods of cleaning and our top of the line power cleaning equipment, coupled with our experienced power washing techs, is highly regarded in the commercial industry. Daycare facilities​ are just another of the commercial properties for which we provide pressure washing services. We are conscious of the importance of safety and health issues needed for a daycare population of children. Therefore, we strive to use our power washing equipment and personnel to perform a high quality job of cleaning both the exterior and interior of the facility with pressure that will sanitize, disinfect and clean. The nature of a daycare lends itself to sticky hands and more. For instance, the occasional stomach upheaval and unfortunate bathroom accidents are prevalent wherever youngsters are gathered. The exterior of a day care is just as important as the interior. Outside play areas are subjected to the same incidents that occur inside. Our power washing professionals use commercially appropriate state of the art pressure cleaning equipment to clean the playground concrete and siding of the building. If you own or manage a daycare for children, you would be very pleased with our pressure washing services. Treat yourself, your small charges and your daycare facility to a top of the line pressure cleaning by calling us at 727-440-4101. One time service offered along with planned scheduled power washing appointments.